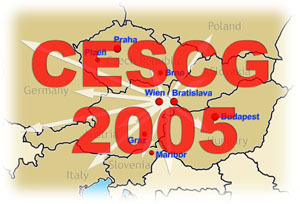 Up to December 13, 2004, we received a large number of announcements of participation in reply to the Call for Participation of CESCG 2005. Thus, we are proud to publish the preliminary program of CESCG 2005. Unfortunately, we were not able to accomodate all requested slots, but we have tried to make a fair selection. Please have a look at the list of talks below and send us as soon as possible the information still missing in the table (names, talk titles). To prepare the successful preparation of printed proceedings and web proceedings for the seminar, we want to remind the participants about how to proceed in preparing their contributions. The detailed timetable can be found in the Call for Participation. Participants are required to upload a zipped version of their submission (including possible supplementary material like additional images, movies, ..., for reviewing) via our submission page by February 4, 2005, 23:59 CET at the latest. Note that this year we do not require an anonymous version. The material will then be distributed for reviewing. Reviews will be sent to the authors by February 28. Final submissions must be uploaded by March 11th, 2005, 23:59 CET at the latest. Submissions which are uploaded after this deadline CANNOT be published in the printed version of CESCG 2005 proceedings. As the HTML version of the proceedings will be prepared in parallel with their printed version, the HTML files have to be here by the same deadline, as well. Please read the upload instructions which are available at our submission web page carefully, such that we have no problems to include all the contributions in the proceedings. Please recall that only those contributions are included in any form of seminar proceedings, that conform to the "Guidelines for Authors" as specified at http://www.cg.tuwien.ac.at/studentwork/CESCG/guidelines/! Please also make sure that all participants of CESCG 2005, esp. the speakers and supervisors, do register as early as possible via the registration page! Realistic modeling of the interaction of light with objects is one important challenge in photorealistic or predictive rendering. Since the modeling of a desired appearance using parametric reflection models can be rather tideous task one way to obtain realistic reflection properties are measurements of real world surfaces. For arbitrary (non-fluorescent, non-phosphorescent) materials, the reflection properties can be described by the 8D reflectance field of the surface, also called BSSRDF. Since densely sampling an 8D function is currently not practical various acquisition methods have been proposed which reduce the number of dimensions by restricting the acquisition to specific classes of materials. A subsequent data modeling step is performed to interpolate missing values and compress the measured data further. In the first part of this talk we will give a brief overview over the different measurement techniques and algorithms used to capture reflection properties of different classes of objects targeted to the specific needs of computer graphics applications. Special emphasis will be given to surfaces with complex meso-structure. In the second part we will discuss some techniques we used for the validation of the measurements and the resulting renderings. Strength and limitations of different aquisition and validation techniques will be discussed and future challenges will be identified. Despite of many years' researches, better and better graphics hardware, tremendous improvement of graphics algorithms, pictures generated by computers are still far from being perfect. We've been trying to synthesize realistic visual effects for many years but, to be quite honest, achieving photo-realism will not be possible very soon. Plenoptic function, which describes the color of any point in 3D, watching at any direction, in any range of light frequency, and in any time moment is too complex (please notice its 7-dimensions) and we don't know how to approximate it accurately. The best known approximation of plenoptic function is a classic photography. So why not to use photos in computer graphics. Taking photographs is a quite easy task, acquisition devices are technology developed and popular, storing is very efficient. Photographs can be used as a textures and environment maps in real time graphics systems. They can store information about light propagation and be used in global illumination algorithms. Recently, the latest constrain of photographs usage - limited dynamic range - seems to be overcome due to HDR (High Dynamic Range) images. HDR photos enables to light up the artificial imaginary in the most natural way. Thanks to photography, realistic visualization can be achieved based on relatively simple computation rather then complex global illumination models. An intention of the talk is to present various possibilities of using photographs in computer graphics. Especially, HDR images abilities are going to be discussed. In the following we present all the talks announced for CESCG 2005.